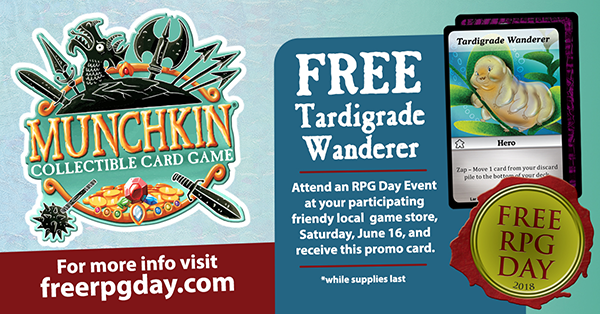 Wander over to a local game store participating in Free RPG Day this Saturday, June 16, to pick up the free Munchkin Collectible Card Game promo: the Tardigrade Wanderer! This miniscule hero is perfect for drafting, or just using for fun in your constructed Munchkin CCG deck. They may be tiny, but this water bear is scrappy! What's Free RPG Day? Exactly what it sounds like! It's a celebration of tabletop gaming, with a focus on roleplaying games, and features a lot of great promotional items. (Is a CCG card a weird promotional item for this? Yes. Are we weird? Also yes.) While you're there, you can pick up even more free swag featured by other publishers for Free RPG Day, and even the newest Munchkin CCG set, The Desolation of Blarg! Find a participating store near you on Free RPG Day's retailer locator, and get some free swag this Saturday!